On day 2 of the 2012 FIBA Olympic Qualifying Tournament Argentina, France, Japan and Korea enter the competition. France come into this competition with a perfect preparation with 7 wins from 7 games. In their last match before coming to Ankara they out-classed Puerto Rico (95-48). 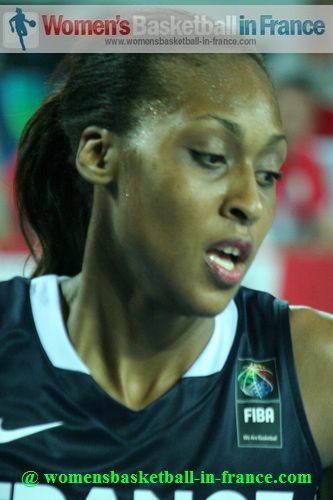 Sandrine Gruda led the way for France with 23 points while Isabelle Yacoubou-Dehoui and Clémence Beikes followed up with 15 and 13 points each. Mozambique's Olympic dream is over as they lost for the second time in two days of the Olympic Qualifying Tournament. They fell short (65-71) in a hard fought match against Korea. New Zealand are also on their way home after falling to Argentina (51-54) in the second game of the day. 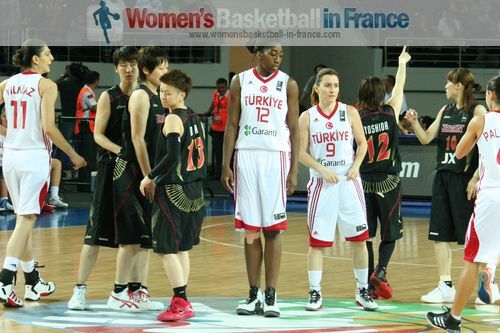 Japan thrilled but ran out of steam by the final quarter against the hosts Turkey and ended up losing (49-65). 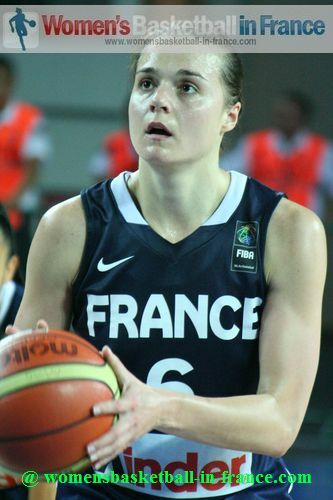 France just did enough to win the last game of the second day of the Olympic Qualifying Tournament against Canada (56-47). The first quarter was incredible with both sides playing offensive basketball from the start. Mozambique had the better start with the first 4 points of the match but the teams were level after five minutes (6-6). Korea relied on their long distance shooting (3-of-8) from beyond the arc while Mozambique hustled as neither side gave an inch. The first quarter ended with a three-point buzzer beater by Yeon Ha Beon (19-19). 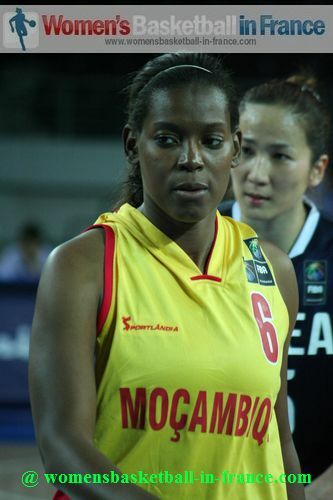 In the second quarter it was the turn of Mozambique to shine from beyond the arc with Deolinda Ngulela leading the way. Mozambique opened the biggest lead of the game after an 8-0 run (35-27) with 16 minutes played. Korea changed tactics and started to play more inside the paint using their mid-range shooting skills as they clawed their way back into the game. Jung-Ja Sin (in picture) was also giving a demonstration in the art of blocking with two more well timed rejections during the quarter. Mozambique's exuberance led to Ngulela colliding with her team-mate Odélia Mafanela and having to leave the court for treatment. She returned after the break. All the same Mozambique went into the interval leading (37-35). The third quarter was more intense with no real pattern as both teams fought tooth and nail for each ball. Despite the physical nature of the game Korea maintained their discipline and kept the turnovers down as they regained the lead (46-45) with three minutes to play in the third quarter. Korea's better shooting and calmness from the charity stripes enabled them to hold on the lead (52-50) going into the final quarter. 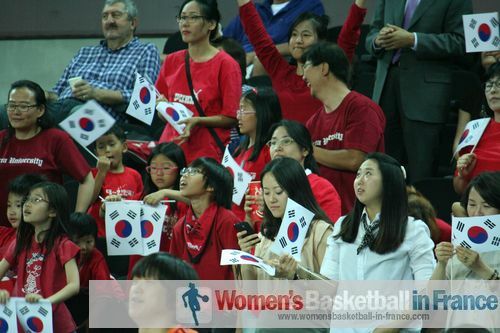 Korea appeared to have the game won leading (62-52) with 4:37 minutes left to play. But with 97 seconds left to play Iliana Ventura knocked in a baseline trey and Mozambique were back in the match. 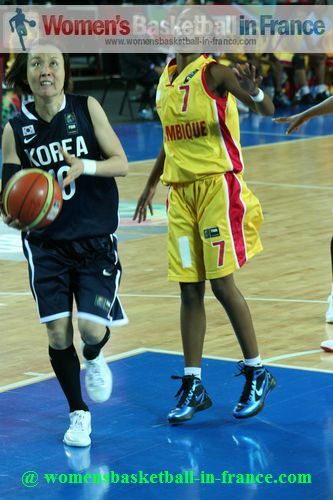 However the Korean duo of Ha Beon and Jung-Ja settled the tie for Korea (71-65). 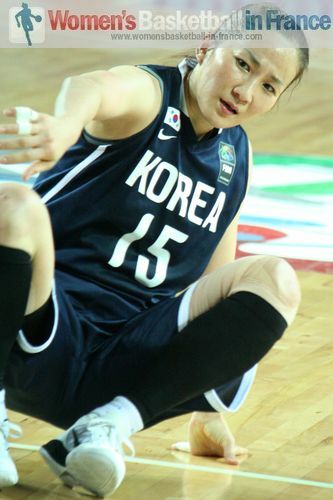 Jung-Ja was the player of the match with 25 points, 11 rebounds and 10 drawn fouls. Mozambique are the first team to be eliminated from the Olympic Qualifying Tournament. After the electrifying pace between Mozambique and Korea this game started very slowly. 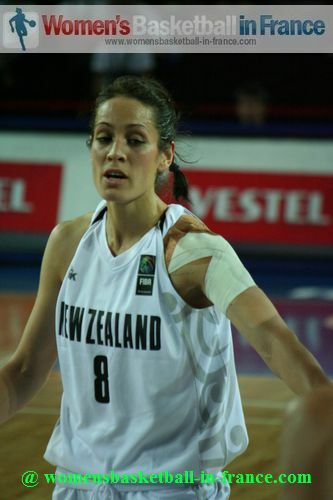 Despite not making many good decisions offensively New Zealand edged the first quarter (16-14) thanks to two shots from beyond the arc from their captain Natalie Taylor. 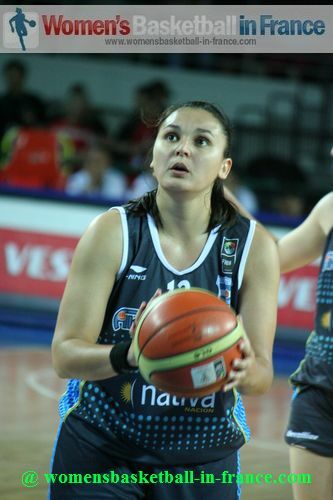 Argentina's captain Erica Sanchez was also good beyond the arc with 2-from-4 in the first quarter. Taylor's scoring streak continued in the second quarter as she scored 11 of her team's first 19 points (19-16). But as soon as Taylor stopped scoring, Argentina started to take control of the game. 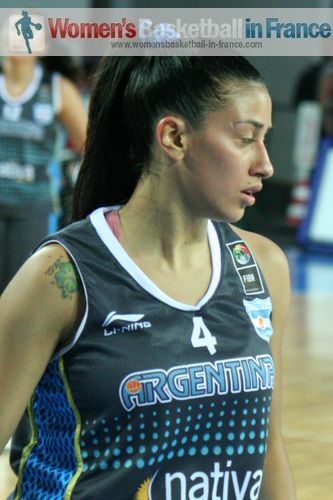 In addition the clutch shooting from beyond the arc by Debora Gonzalez (in picture) and Sandra Pavon allowed Argentina to go into the locker room ahead (32-27). 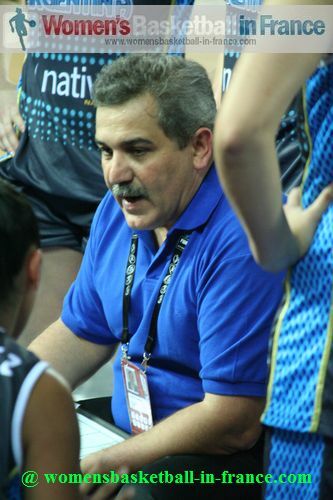 The introduction of Marina Cava during the latter part of the third quarter proved to be excellent as hustle and energy allowed Argentina to win loose balls and get second chance opportunities to extend their lead (43-37) during a low scoring defensive third quarter. We had to wait until the final five minutes for New Zealand to step up their game and try and stay in the competition. Trailing (43-49) after a three-ball by Melisa Gretter, Antonia Edmondson and Taylor hit back to back scores to reduce the deficit (47-49). 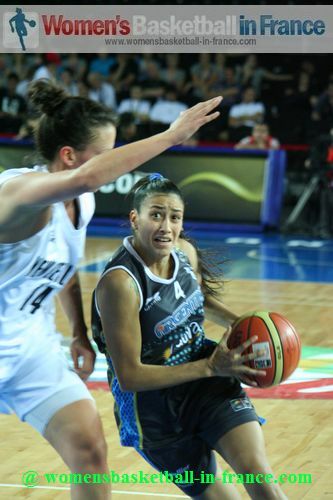 Argentina struggled to get past the New Zealand defense and continued to miss until Paula Reggiardo managed to drive to the basket to give Argentina some breathing space (51-47). New Zealand tried everything during the last 30 seconds but the ball refused to drop. 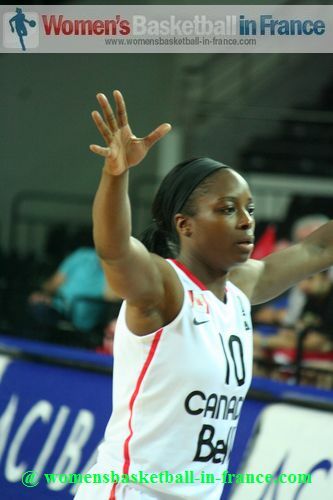 In the end Argentina won (54-51) and join the Czech Republic in the quarter-final of the Olympic Qualifying Tournament from Group B.
Kuanitra Hollingsworth (right in picture) scored 8 points for Turkey before coming off for a break (13-6) with seven minutes played in the first quarter. What was more interesting about her performance was that she did not understand the system being played despite lots of explanations from Tugba Palazoglu and Birsel Vardarli. Japan played quickly and scored most of their first-quarter points on fast breaks to trail (8-16) after the first quarter. When it comes to three-point shooting from the top of the arc, Esmeral Tuncluer from Turkey is an expert. She was only given a fraction of a second but still hit the shot to the delight of the hosts' fans. Japan were not intimated by the crowd or the occasion and hit back to back points which resulted in the Turkish coach calling a time-out with just three minutes played. Hollingsworth returned and Turkey regained control despite the efforts of Maki Takada, Yuka Mamiya, and Yuko Oga. However Hollingworth quickly picked up her 3rd foul for a hard hit against Mamiya and left the field. 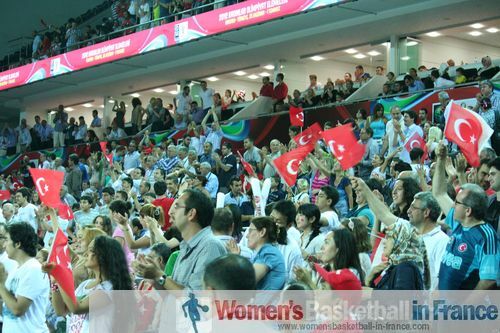 The Turkish fans did not agree on the decision and the hall erupted. Despite the uproar everybody calmed down and Turkey continued to dominate and pushed the advantage into double digits after a three-pointer by Palazoglu (30-18) with just under 17 minutes played. Japan's main problem was that they had nobody strong enough to hold off Nevriye Yilmaz under the basket and as a result conceded too many easy points. All the same Japan continued to thrill with their energy and spectacular points. 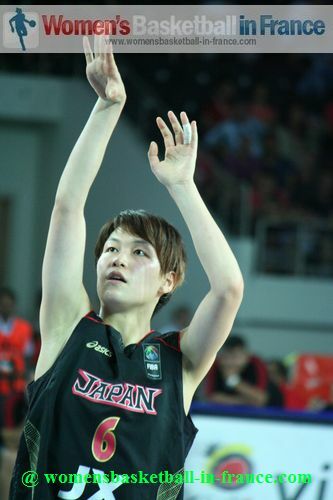 Ryoko Yano became only the fourth Japanese player to score with a long three-ball. Turkey walked into the locker room in front (36-23) with the duo Tuncluer and Yilmaz on 10 points each. Japan started the third quarter as if their shorts were on fire and hit the hosts 7-0 with less than two minutes played. Ceyhun Yildizoglu called an immedaite time-out to put a stop to the Japanese attack. Afterwards was all about attack from both teams. The game changed dramatically as Turkey were forced to play at the same speed as Japan. 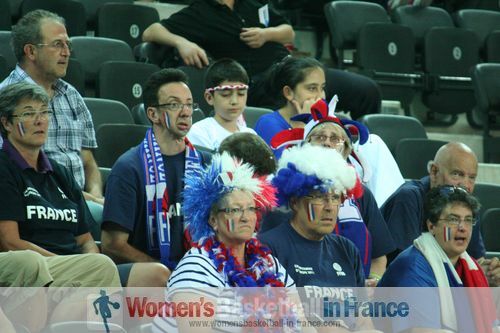 The supporters from the two countries were treated to some excellent basketball with both teams giving their all. Turkey still held the lead at the end of the quarter (52-39). 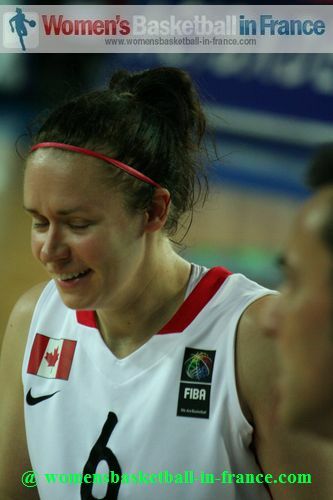 Yet Japan were in trouble when their leading scorer Yuka Mamiy picked up her 4th foul two seconds at the end of the quarter and had to leave the game for the first time. By the time Yuka Mamiy returned to the game, three minutes into the final quarter her side trailed by 20 points (39-59) and the contest was over. Yuka Mamiy eventually fouled out as the game fizzled out while both coaches finished the match with their bench players. 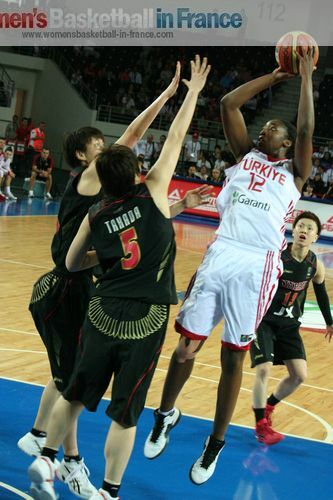 Turkey won the game (65-49) and have topped group A while Japan face Puerto Rico in the deciding match for a place in the Olympic Qualifying Tournament quarter-final. A steady start from France with 7 unanswered points in the first four minutes of the game forced the Canadian coach to call for a time-out. 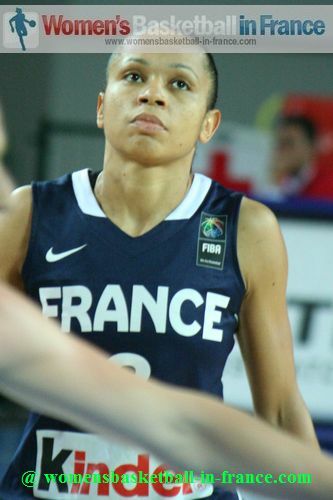 Natalie Achonwa ended the French run with her team's first points. 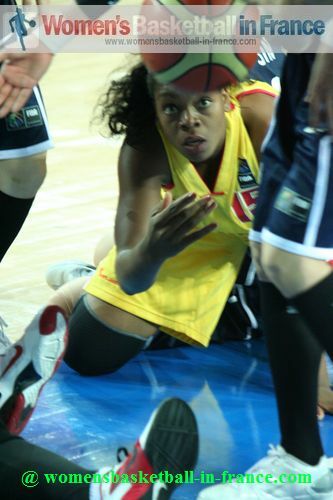 However France continued to dominate and led (16-3) with Isabelle Yacoubou-Dehoui (in picture) having fun with 8 points. 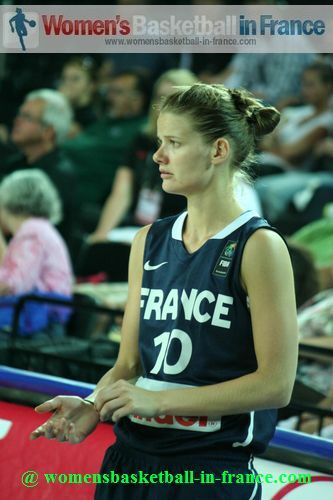 Yet France had to settle for a 10-poinnt lead by the end of the first quarter (21-11). The second quarter was played at slow pace. 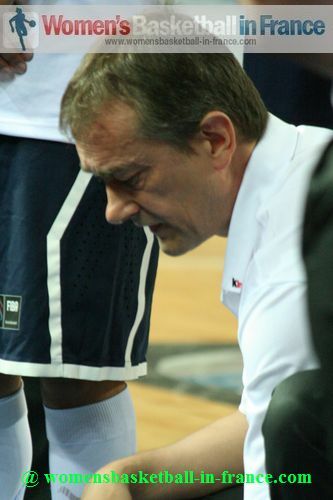 Pierre Vincent decided to play his whole team and changed players frequently. This resulted in a high number of turnovers and very few points. On the other side Canada stuck to their game plan. They more or less matched France basket for basket in a low scoring quarter and went in the locker trailing by just 11 points (24-35). 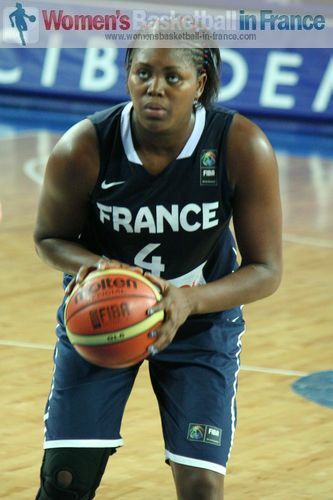 France stepped up defensively at the start of the third quarter, while Yacoubou-Dehoui took care of the attack. 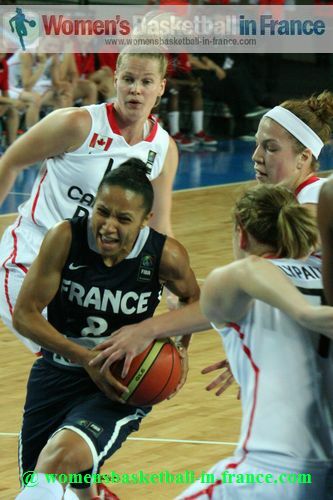 France led (44-29) with 25 minutes played. However as soon as Yacoubou-Dehoui returned to the bench, France struggled with scoring. 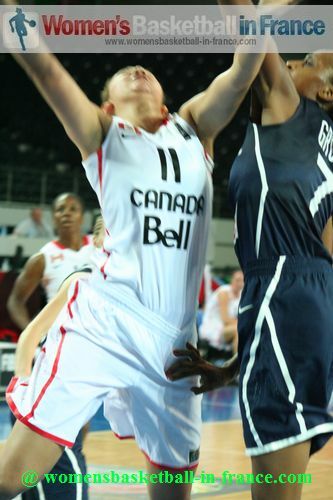 This allowed Canada to finish the quarter on a 7-4 run to trail by just 12 points (36-48). Canada were more aggressive during the final quarter. But without Achonwa on the court (she had taken a heavy knock in the first quarter) they lacked the finishing inside to punish France significantly to make up the deficit. 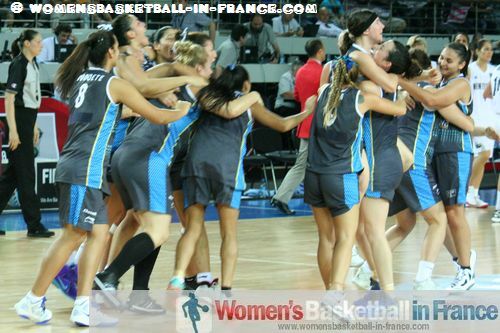 France were not spectacular but did just enough to hold on for victory (56-47). It is unlikely that Mali can qualify for the quarter-final of the Olympic Qualifying Tournament from Group D after their heavy defeat against Canada on the opening day. Mali will play France in the final game of the round robin group stage in the Olympic Qualifying Tournament.